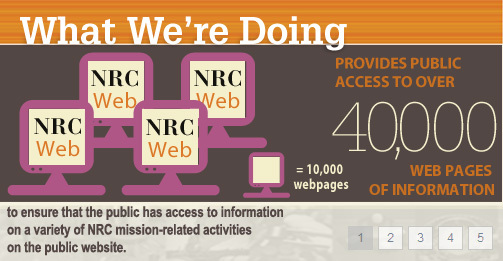 By now, you’ve probably noticed the new infographic panel on the NRC public website’s revolving section of news and events photographs. Complementing the agency’s efforts to be more transparent and broaden our public outreach, the infographic panels serve as a visual representation of “What We’re Doing.” We have added hyperlinks to the images directing viewers to web pages with further information on the topic discussed. The first infographic panel showed that we provide public access to over 40,000 web pages of information with a hyperlink to our “What’s New on the Web” page. Others will highlight our other accomplishments. A different infographic panel will appear weekly through December; they will also be available through the Flickr NRC Photostream. Let us know with your comments below or send us an email at opa.resource@nrc.gov . I am saying good day from Germany. Thank you for the information. If you believe in open government why are the sessions concerning geological, hydrological, seismic and other safety descriptions of Small Nuclear Reactors(SMR) conducted in secret, behind closed doors? There is nothing concerning “proprietary confidential” information related to public safety unless there is something to hide. You state you are open, but practice an entirely different open government philosophy which benefits the nuclear industry instead of the public’s health and welfare relating to the SMR issue. Open, transparent government is your responsibility and .important for our Republic’s freedoms and liberty. Info Graphics is a smoke screen, a delusion as it relates to SMR’s and other issues such as the safety of elevated cooling pools of the GE Mark 1 & 2 dangerously defective nuclear reactors. Open your closed processes relating to citizens safety and risks and maybe the info graphics will have meaning. There is the appearance of openness as reflected in the info graphics displayed; reality of actions for the SMR and defective nuclear reactor systems is a different situation. Your secrecy and closed processes are appalling and negligent. Your responsibilities relating to health and safety are to the citizens, not the nuclear industry’s bottom line. Frankly, after several years of close scrutiny of the NRC’s operations of regulating the nuclear industry you are a disappointing Federal Regulator whose efforts seem to be pointed at support of the nuclear industry and not the health and safety of U.S. citizens.